One of the only woman-y magazines I subscribe to is Real Simple. My daughter and I like to laugh about how thick the magazine is when it's supposed to make life simpler, but it is chock full of stuff I like, and in bite size pieces. 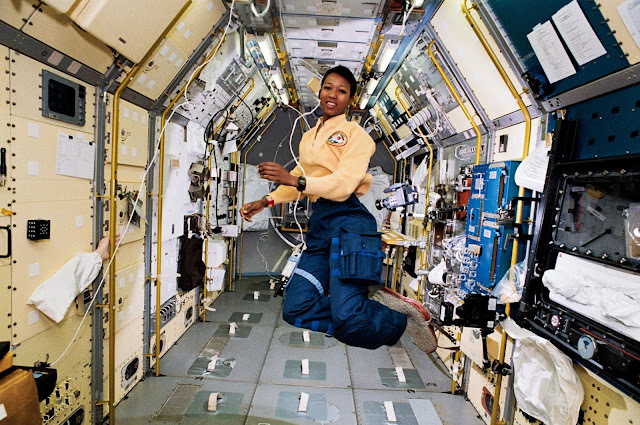 I was flipping through the September issue and came across a brief interview with Mae Jamison, the first African American female astronaut, and was on the Space Shuttle Endeavor. She has a list of accomplishments (besides being an astronaut) that are pretty incredible. "I encourage others to take risks. But taking risks doesn't mean putting people in danger. It means risking that you might do something other people might not get right away and they may laugh at you. Just as leadership isn't really about being in charge. It's about prodding and poking to get the best work out of people. It's about using your place at the table and not always minding your manners." AWESOME, don't you think? Unfortunately I can't find the entire article on line. But if you see the September Real Simple while you are checking out at your local grocery store, turn to page 125 for a quick but awesome look at a tremendous woman.